Eton Mess is the most classic of British desserts, and although you can count on it to be delicious (what’s not to love about meringue, berries and cream? 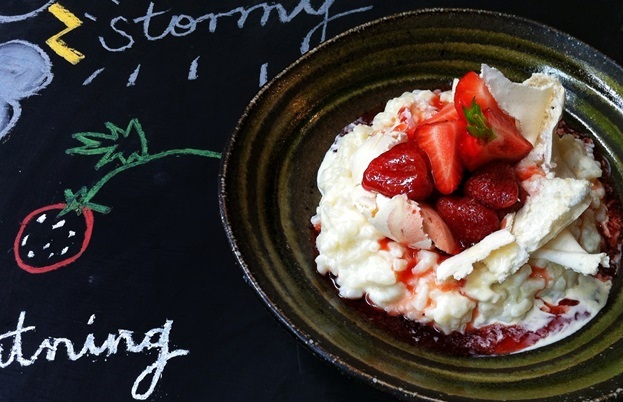 ), you can’t always count on the weather… Food writer and blogger Miriam has come up six variations on Eton Mess to suit every possible weather forecast. 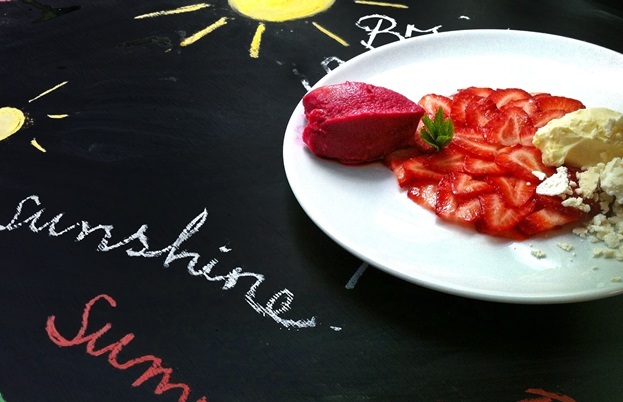 Eton Mess (or Clare College Mush) is a classic British summer dessert. It’s simple, delicious and perfect for a bright summer day… but what if your summer day isn’t bright, or summery? So far this summer I think the weather has been particularly changeable. Is it still classed as “changeable” or “unpredictable” if it happens every year? Perhaps; it’s more plausible that in Britain it is never consistently sunny in summer, nor is there really any of that fluffy snow on Christmas Day (as all my favourite Richard Curtis movies would have me believe). With this in mind I have taken the decision to face up to my high expectations for British weather conditions and adapt to the reality. This year I have gotten used to carrying an extra jumper, an umbrella and a pair of sunglasses with me everywhere I go and I intend to apply the same logic to some classic cooking and be a bit more flexible. 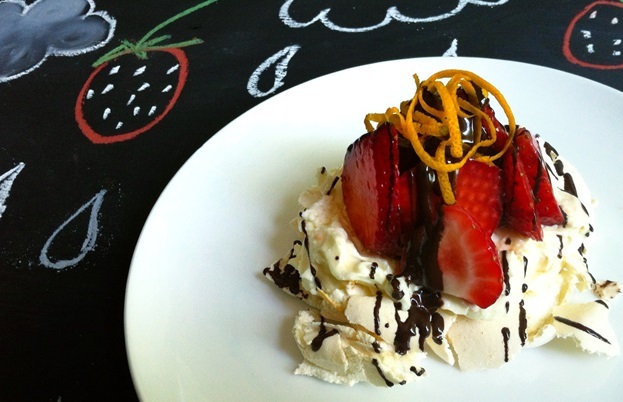 The basic Eton Mess recipe involves strawberries and meringue folded into softly whipped double cream, but I can think of few things more depressing than to eat this dish, in mid July or August, sat indoors looking out of the kitchen window at the rain soaked garden furniture. Conversely (and possibly controversially) I don’t find cream particularly desirable on a very very hot day (with the exception of a little clotted cream of course!) I’d pick yoghurt over cream or sorbet over ice cream every time. With all this in mind I have created 6 variations on the classic Eton Mess, each to match a different summer forecast, so make sure you find out what Carol Kirkwood has to say before you hit the shops for ingredients. Each recipe involves meringue, which you can make yourself but all these recipes will work fine with a shop bought version. If you are going to make your own; for the most part don’t worry if they crack, that’s fine, you’re going to be breaking them up anyway) This recipe makes 8 medium sized meringues or 12 mini ones. If it’s very hot this is lovely! Take 1 punnet of strawberries and remove the stalks. Slice your strawberries very thinly and arrange on each plate. If you’re being really neat you can put a saucer over the top and trim the arrangement with a sharp knife to get a perfect circle. Add a scoop of strawberry or raspberry sorbet on one side of the plates and a heaped teaspoon of clotted cream on the other side. Garnish the sorbet with fresh mint leaves and the clotted cream with some crumbled meringue (you will only need half the quantity of the recipe above). Perhaps my ideal summer weather conditions; warm but not stifling with a cool breeze. Take a punnet of strawberries, remove the leaves and cut into quarters. Add 100ml of elderflower cordial to the fruit, stir and set aside. Meanwhile softly whip 300ml of double cream and add the seeds from a vanilla pod and 1 tablespoon of icing sugar. Make a batch of meringues (as per the recipe above) but use golden caster sugar instead of white. Break the meringue into pieces and fold into the cream. Serve the cream and meringue mixture alongside the strawberries and drizzle any remaining elderflower syrup (which by now will be stained pink) over the dessert. Dust with a little icing sugar and garnish with edible flowers like nasturtiums or lavender. At least it isn’t raining. Well if we can’t have any sunshine outside we can attempt to put some on the plate. Make a batch of meringues (as per the recipe above) but make them small and as round as you can, they should be heaped teaspoon size. Finely dice a punnet of strawberries. Place them in a bowl with the juice of half a lemon, 6 shredded basil leaves and a few twists of freshly ground black pepper. Set aside until you’re ready to serve. Put a layer of the strawberry mixture at the bottom of each dish. Add a couple of spoonfuls of greek yoghurt and then add the mini meringues. Finish with a garnish of passionfruit and a basil leaf. I think that distinctive smell of summer rain is rather nice and surprisingly the combination of Cointreau, orange zest and dark chocolate in this recipe brings out a similar fragrance. Prepare a punnet of strawberries by removing the stalks and cut each one in half. Place the strawberries in a bowl and add 50ml of Cointreau (or another orange liqueur, if you’re prefer not to use alcohol try using the same quantity of freshly squeezed orange juice) leave to marinate for 30 minutes. Meanwhile mix 250g of mascarpone with the zest of 1 large orange and a teaspoon of icing sugar and place in the fridge. Melt 100g of dark chocolate in a bowl over a pan of simmering water. 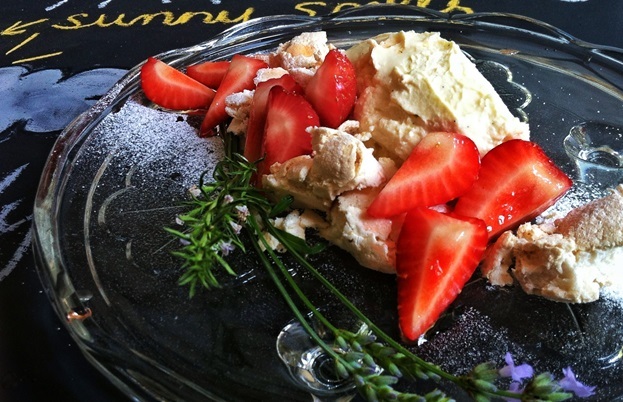 Place a meringue or large pieces of meringue on each plate and top with the mascarpone mixture. Pile the strawberries on top and drizzle the whole thing with the melted chocolate. Garnish with more orange zest and serve. 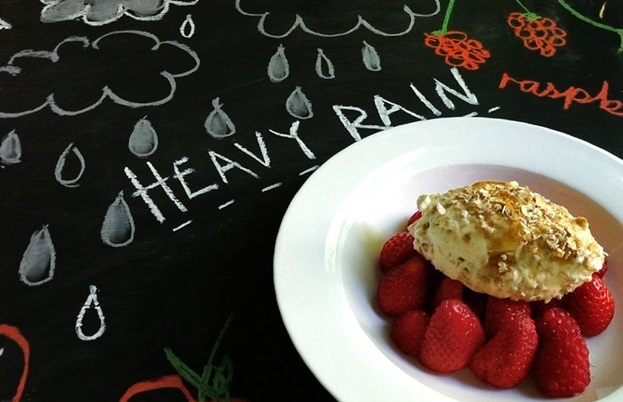 This recipe is similar to cranachan so change out of those soaked shoes, wrap a towel round your hair and pretend you live in a magnificent Scottish castle; then who cares if it’s raining! Remove the stalks from a half a punnet of strawberries and arrange whole on dishes (cut side down) with a punnet of raspberries. Whip double cream until thick (careful not to over do it) and fold in 1 quantity of meringue (see recipe above) broken into pieces. Then add the oat mixture to the cream, don’t fully mix it in, you want to get a marbled effect and then add this to the fruit. Drizzle with some extra honey and serve. This is supposed to be summer! What’s going on?! Never fear, seek comfort in a bowl of rice pudding…and a little brandy. Make a batch of meringues (as per the recipe above) and break into shards. Heat 100g of short grain/pudding rice or Arborio rice in a pan over a medium heat with 600ml milk, the seeds of a vanilla pod and 1 tablespoon of sugar, stir regularly until the rice is soft and creamy. Take a punnet of strawberries and remove the stalks and cut each one in half. Place the strawberries in a pan with 100ml of brandy, (reserve 1 or 2 strawberries uncooked for decoration) heat gently until the strawberries are soft and the liquid is red. Take of the heat, taste and add a little caster sugar and/or more brandy if needed. 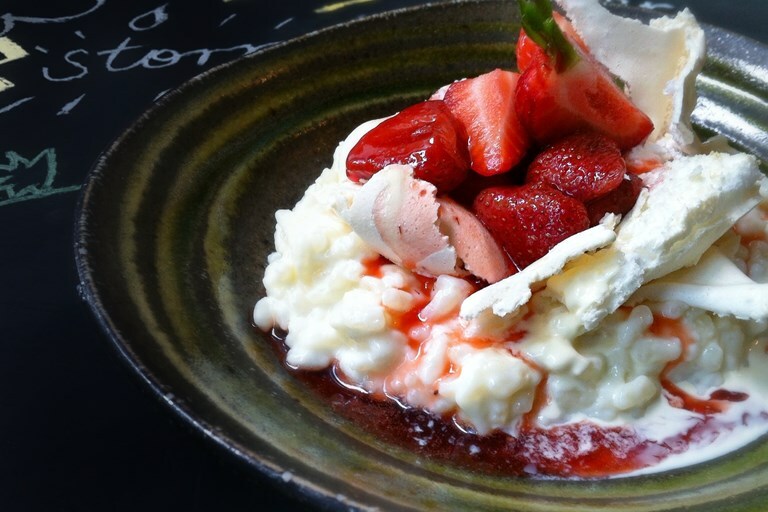 To serve, place a large spoonful of the rice pudding in the centre of the plate, top with the meringue and then strawberry compote allowing the brandy syrup to flow into the rice pudding. Finish with a fresh strawberry and serve. 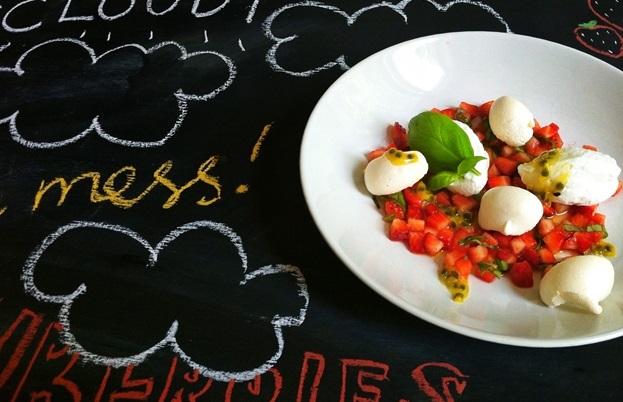 Have a look at Miriam Nice's Flickr account for all the photos from her Eton Mess project. What has been your favourite dessert this summer?